It’s practically impossible to go anywhere without seeing someone puffing on an e-cigarette, the exponential growth of popularity with such devices is astounding. People are using e-cigarettes to help them quit or as a healthier alternative to traditional tobacco. However, there are those, too, who are attracted to e-cigarettes because there are no laws in most places on smoking them indoors. As a result, major cities like Los Angeles, New York, and Chicago are working to ban the use of e-cigarettes in public places. There are a number of public health officials that fear e-cigarettes will lead to some people smoking regular cigarettes, according to the Wall Street Journal. City Council members in New York voted last month to ban the use of e-cigarettes in public places. New York City Mayor Michael Bloomberg, in his twelfth hour, has signed the bill restricting electronic cigarettes in public places including: restaurants, bars, stores and some parks, the Daily Record reports. Legislators in Los Angeles and Chicago could vote on e-cigarette bans this month as well. While e-cigarettes may be healthier than traditional tobacco, there are critics who say secondhand vapor is a pollutant, and e-cigarettes can get more people addicted. 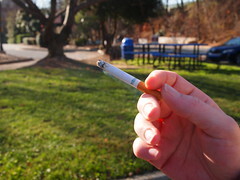 “There are reasonable concerns and reasons for folding them into the existing clean-air framework for cigarettes,” Tim McAfee, Director of the Office on Smoking and Health at the Centers for Disease Control and Prevention, told the newspaper. Studies suggest that e-cigarettes expose the public to nicotine the same way that regular cigarettes do, although, according to researchers the amount of nicotine with e-cigarettes is much less.